Cashew (Anacardium occidentale) is widely grown in the tropics because of its cashew nuts and apples. The cashew apple can be eaten raw or used in the production of jam, chutney, pickles or various beverages like juice and wine. The primary product of cashew nut is the kernel which is used extensively in the confectionery and baking trade. The cashew nut kernels are popular dessert, generally eaten roasted and salted. The main goal of processing is to remove the valuable cashew kernel from the shell with minimal damage. Difficulties in shelling cashew nuts are due to irregular shape of the nut, the tough leathery outer shell and the cashew nut shell liquid. In cashew processing, micro-entrepreneurs can start with two shellers and a charcoal-fired oven to produce plain roasted cashew kernel. This combination of cashew postharvest facilities can be operated at a minimum input level of 4,000 kg cashew nuts. This will require a working capital of P50.000 worth of cashew nuts and processing facilities worth P18,000 including the weighing scale, kalukati, impulse sealer and others. This investment can generate a net income of P125,000 for a period of only two months with a Return on Investment (ROI) of 68.64% and a payback period of 1.46 years. 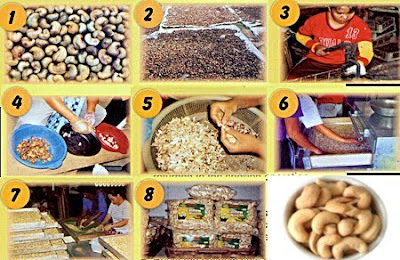 The various cashew nut processing steps differ in accordance with the scale of operation. In some cases, all steps of the processing are manually carried out by small-scale processors. In commercial processing, various pieces of equipment are used. The cashew nut processing operations consist of cleaning, roasting, shelling, separation, drying, peeling, grading and packing. Clean cashew nuts of foreign matters like sand, stones and dried apple. Shell big cashew nuts with the BPRE cashew nut sheller. Split the other nuts using kalukati (an indigenous tool). Separate the shelled pieces from the kernels. The unshelled nuts are returned to the shelling operation. Peel the testa manually by gently rubbing with fingers. It is important that the kernels are neither cut nor damaged during the peeling process. Grade the kernels for quality control. Shelled, dried and peeled kernels are graded for export according to size and condition. Pack into appropriate containers the cashew kernels. Whole kernels command higher price than do broken pieces. To produce whole,Cashew Nut Shell Liquid (CNSL)-free cashew kernels, BPRE adapted from Khon Khaen University of Thailand, a low cost, manually-operated shelter for small-scale processors. The BPRE whole cashew kernel sheller produces more whole kernels. Moreover, the sheller is locally manufactured, very affordable and easy to operate. Hi I’m interested on Whole Kernel Sheller for our project in Palawan please provide as info.